The latest version of the planetary part of the numerical ephemerides EPM (Ephemerides of Planets and the Moon) developed at the Institute of Applied Astronomy of the Russian Academy of Sciences is presented. The ephemerides of planets and the Moon were constructed by numerical integration in the post-Newtonian metric over a 140-year interval (from 1880 to 2020). 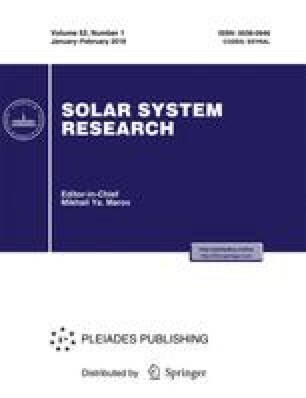 The dynamical model of EPM2004 ephemerides includes the mutual perturbations from major planets and the Moon computed in terms of General Relativity with allowance for effects due to lunar physical libration, perturbations from 301 big asteroids, and dynamic perturbations due to the solar oblateness and the massive asteroid ring with uniform mass distribution in the plane of the ecliptic. The EPM2004 ephemerides resulted from a least-squares adjustment to more than 317000 position observations (1913–2003) of various types, including radiometric measurements of planets and spacecraft, CCD astrometric observations of the outer planets and their satellites, and meridian and photographic observations. The high-precision ephemerides constructed made it possible to determine, from modern radiometric measurements, a wide range of astrometric constants, including the astronomical unit AU = (149597870.6960 ± 0.0001) km, parameters of the rotation of Mars, the masses of the biggest asteroids, the solar quadrupole moment J2 = (1.9 ± 0.3) × 10−7, and the parameters of the PPN formalism β and γ. Also given is a brief summary of the available state-of-the-art ephemerides with the same precision: various versions of EPM and DE ephemerides from the Jet Propulsion Laboratory (JPL) (USA) and the recent versions of these ephemerides—EPM2004 and DE410—are compared. EPM2004 ephemerides are available via FTP at ftp://qua-sar.ipa.nw.ru/incoming/EPM2004. Translated from Astronomicheskii Vestnik, Vol. 39, No. 3, 2005, pp. 202–213. Original Russian Text Copyright © 2005 by Pitjeva.